It took a four-year-old’s birthday party for me to leave behind the malls and rush of Christmas preparations for a few lovely hours of a pass time I am oh-so passionate about. It’s an activity that I partake in during our long Canadian winter that calms me and makes me glow inside, despite the icy cold, and actually brings some melancholy early in March or April that winter weather is breaking up. The four-year-old was my daughter’s fiancé’s niece. Her birthday was a skating party, and while her uncle and mom assisted her in putting on brand new skates, I was lacing up my thirty-year- old skates for the gazillith time and already feeling the rush of pleasure my winter sport gives me. 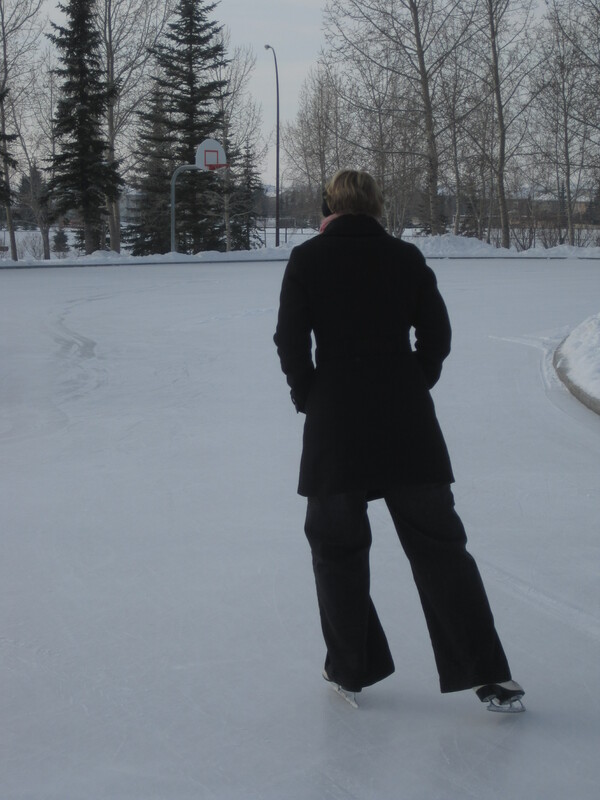 Though neither of my parents skated themselves, on crisp winter days they’d drive us over to the rink and if the concession wasn’t open, they’d kneel over the snowy parking lot with the youngest of us five kids balanced on the edge of the car’s seat and tie or help tighten five pairs of skates. The littlest kids would be lifted up high over the heaped up snow around the pleasure rink and then set free to circle round and round the freshly shoveled surface. Somehow they’d taught my older brother and sister to maneuver over the ice, and then passed on the job of teaching me – to them. To this day I recall my siblings wool mitts holding mine and the two of them telling me together,” Push, push, glide. Push, push, glide.” Who knows which I enjoyed more, being the focus of my sister and brother’s attention, suspended between them on a snowy afternoon, or the exhilaration of a well balanced long glide? If enough neighborhood kids showed up there might be a game of tag on skates, or the even riskier Red Rover. On the best days the concession would be open and music would be playing over crackly speakers so we could skate to Big Girls Don’t Cry, or You Are My Sunshine and warm up our numb toes in a basement room that smelled of sweat, wet rubber mats and watery hot chocolate. With a nickel we could treat ourselves to a thick sugary square of sponge toffee. At the recent pre-Christmas birthday party the four-year-old’s uncle and my own daughter gave the little girl lessons with the historic push, push, glide and I took my first strokes of the winter across the even ice. The morning clouds were lifting, the sun was creeping over the horizon, and our breath puffed out in steamy halos. I listened to the swish, swish, then ‘tock’ sound of blades hitting against thick ice and thought, for this I will hang onto winter. Music came on the overhead speakers, Black Eyed Pea’s I Got A Feeling, the sound of 2010, not the sixties or seventies of my youth, but I was okay with that as my grown-up daughter left the others and joined me and together we push, push, glided around and around the rink until we could do just one more circle, and then one more again, before the minus twelve weather was too much for all our fingers and toes. New Year’s Resolution 2011 – Skate More…push, push, glide…push, push, glide. . . So true, so true. I’ve been guilty of texting when I should have been listening, and now it is annoying me in others – I think we should go off to the bathroom maybe to text sometimes … and from there maybe we will have texting rooms? ?